There was a time when we did not take the availability and abundance of everything for granted. Most of us have parents or grandparents who were around during World War II that can tell stories of ration stamps for certain food and clothing items, fuel, tires, and other things. I have a few given to me by my grandfather. Many industries, including electronics manufacturing, were strongly encouraged or required to dedicate all efforts toward war production. Crosley Corporation, based in Cincinnati, Ohio, was no exception. 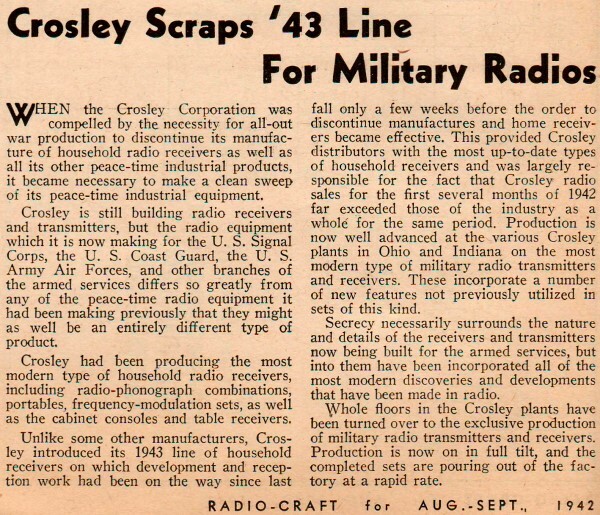 A notice of Crosley abandoning their 1943 line of commercial radios to make way for military radios appeared in the September 1942 edition of Radio-Craft magazine. This is of particular interest to me since I just completed the restoration of a 1941 vintage Crosley 03CB floor console radio. It means I probably have one of the last pre-war models of a Crosley radio! When the Crosley Corporation was compelled by the necessity for all-out war production to discontinue its manufacture of household radio receivers as well as all its other peace-time industrial products, it became necessary to make a clean sweep of its peace-time industrial equipment. 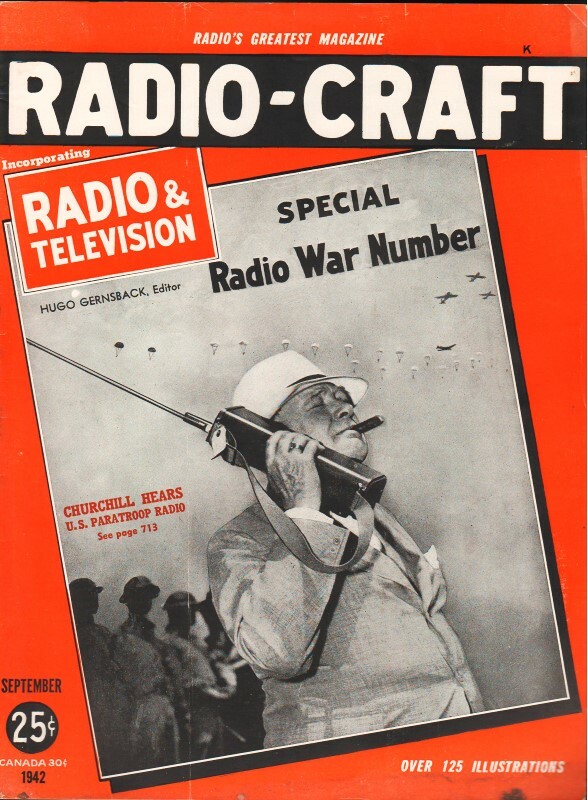 Crosley is still building radio receivers and transmitters, but the radio equipment which it is now making for the U. S. Signal Corps, the U. S. Coast Guard, the U. S. Army Air Forces, and other branches of the armed services differs so greatly from any of the peace-time radio equipment it had been making previously that they might as well be an entirely different type of product. Crosley had been producing the most modern type of household radio receivers, including radio-phonograph combinations, portables, frequency-modulation sets, as well as the cabinet consoles and table receivers. Unlike some other manufacturers, Crosley introduced its 1943 line of household receivers on which development and reception work had been on the way since last fall only a few weeks before the order to discontinue manufactures and home receivers became effective. This provided Crosley distributors with the most up-to-date types of household receivers and was largely responsible for the fact that Crosley radio sales for the first several months of 1942 far exceeded those of the industry as a whole for the same period. 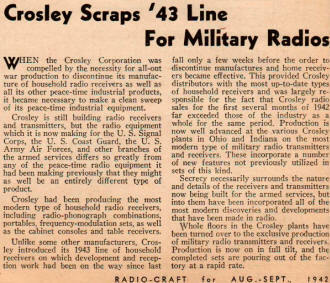 Production is now well advanced at the various Crosley plants in Ohio and Indiana on the most modern type of military radio transmitters and receivers. These incorporate a number of new features not previously utilized in sets of this kind. Secrecy necessarily surrounds the nature and details of the receivers and transmitters now being built for the armed services, but into them have been incorporated all of the most modern discoveries and developments that have been made in radio. Whole floors in the Crosley plants have been turned over to the exclusive production of military radio transmitters and receivers. Production is now on in full tilt, and the completed sets are pouring out of the factory at a rapid rate.